1.Prepare Cherry Chutney: In medium saucepot, heat cherries, vinegar, brown sugar and salt to a simmer over medium heat; reduce heat to medium-low and simmer 18 minutes or until most of the liquid has cooked out. 2.Prepare Flavored Mayo: In small bowl, stir mayonnaise and mustard until well combined. 3.Prepare Burgers: Prepare outdoor grill for direct grilling over medium heat. In large bowl, gently mix ground chuck, salt and pepper until well blended but not overmixed. Form mixture into four patties. 4.Place burgers on hot grill rack; cover and cook 10 minutes or until internal temperature reaches 160°, turning once. About 2 minutes before burgers are done, place buns, cut side down, on hot grill rack; cook 2 minutes or until buns are toasted. 5.Spread bottom buns with Flavored Mayo. 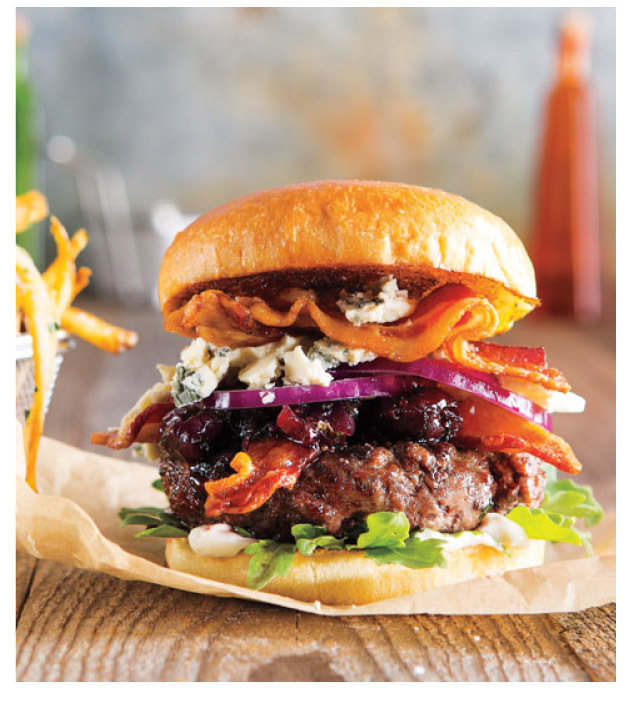 Evenly top with arugula, burger, half the bacon, Cherry Chutney, onion, cheese, remaining bacon and top bun.